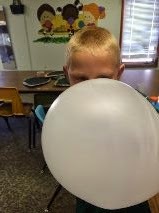 This year for Vacation Bible School we chose a free program we found on the internet about the Armor of God called Bible Boot Camp. The ladies at church weren't sure we could pull off VBS this year, and didn't decide for sure until two weeks before. I am always in charge of crafts, so as soon as we picked this curriculum I started thinking about what we should make. I try to make a craft that goes along with the story, but sometimes I just want to make something I think the kids will really like. 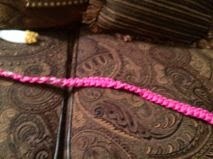 Belt of Truth ~ I had the older two classes make a belt out of clothesline from the dollar tree. The preschool class made hand print frogs. Shield of Faith ~ We made a chalkboard shield for this day. This was actually completed on several days. I had previously cut shields out of cardboard, so we had to paint them with primer one day, then two coats of chalkboard paint. On the last day we added printed duct tape for a boarder and to cover up our cardboard edges. Breastplate of Righteousness~ For the breastplate we made spoon puppets. Not all the kids made a breastplate, some of the girls still made theirs look pretty. 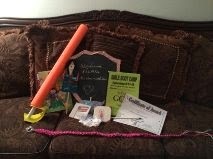 Sword of the Spirit~ All the kids made a sword. 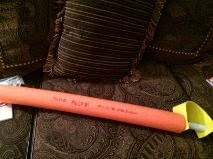 I used 1/2 of a pool noodle and inserted an 8" piece of pvc pipe in the end for a handle. 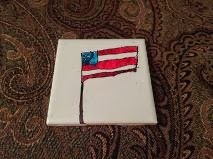 Kids love to use permanent markers, so I let the kids draw on ceramic tiles with the markers. The little kids used alcohol to smear their scribbles, and the big kids used that for their background. 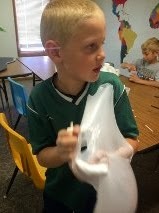 We also made some goop out of Elmer's glue & liquid starch. once we got it mixed together to form a smooth ball. 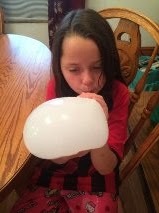 We used a small straw to blow big bubbles. The last project we completed didn't have anything to do with our lessons. We decorated cake. I baked the cakes & cupcakes prior to class. 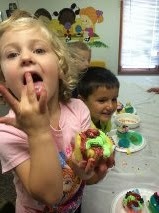 The older two kids decorated small cakes & the small class decorated cupcakes with icing & sprinkles. We have done this several times in the past, but the kids love it & I had a couple of them ask me before VBS if we could decorate cake again. 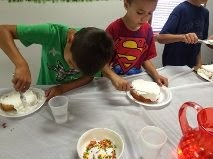 I think all the kids had a great time of fun and fellowship with each other while learning about God.